G.I. 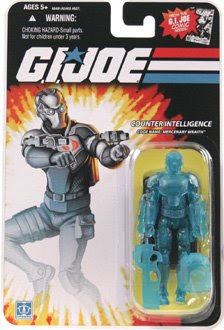 Joe wave 10 action figure Wraith (holographic variant) is this week's Hottest Toy. He is a hard to find shortpacked chase figure that is selling for a huge premium right now on Ebay (over $100 for a $7 figure). Good luck finding him in stores. As for me, I've heard too many stories about toystore employees fishing figures like this out of the backroom boxes before they hit the shelves to think I'll ever find one hanging on a peg.